Extract from Thomas Clarkson's 'Thoughts on the Necessity of Improving the conditions of the Slaves in the British Colonies?.' 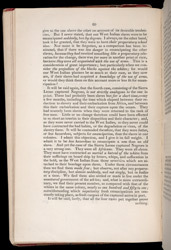 Clarkson was one of the leading British campaigners against slavery and this book was published in order to highlight the plight of the enslaved population in the Caribbean in the 1820s. Clarkson argues that the 1807 act to abolish the slave trade had done nothing to improve their situation.